Western Michigan University’s (WMU) $24M Heritage Hall renovation is a finalist for Best Public Project in the 2016 Governor’s Energy Excellence Awards (GEEA). GEEA celebrates outstanding achievements in energy excellence, and seeks to recognize people and organizations that have taken firm, meaningful actions to stop energy waste. WMU is one of 3 finalists in the Best Public Project Category alongside Parchment School District & East Jackson Community Schools. The sustainability team at WMU is putting a spin on the popular phrase out with the old and in with the new. Instead of tearing down the old, WMU made the old new again. WMU’s sustainability team completed a historical rebuild of the beautiful Heritage Hall building, home of the Alumni Center on Prospect Hill. Not only did they renovate a 110 year old building, they renovated it all while designing for Leadership in Energy and Environmental Design (LEED) Platinum certification. The original construction and birthplace of WMU was completed in 1905 at 34,000 square feet. The facility was renovated and made its official debut as Heritage Hall just in time for Homecoming Weekend in October of 2015. The building nearly doubled in size totaling 53,000 square feet and features a large ballroom for events. Later this year, WMU will host the US Green Building Council of West Michigan for their annual membership meeting in the ballroom. The event will open with WMU President John Dunn sharing their story on sustainable higher education and finish with a Murder Mystery party. The WMU team made their energy efficiency mark on Heritage Hall by implementing geothermal heating and cooling from 56 geothermal wells which will provide 50% greater efficiency than traditional sources. They incorporated LED lighting, low energy windows, low-flush toilets and new insulation. The renovations transformed one of the least efficient buildings on campus into one of most efficient buildings. Constructing efficient buildings while applying LEED standards is second nature to WMU. They certified the first LEED Gold Existing Building in the state of Michigan with its College of Health and Human Services. WMU has committed to meet USGBC Silver LEED certification for all new construction projects and modifications of existing properties on campus. The LEED buildings on campus include the Chemistry Building, College of health and Human Services, Brown Hall, Sangren Hall, the LEE Honors College, and the latest phase of construction on Western View Apartments. “Over the last 18 years WMU has been able to reduce its energy use intensity by over 23%,” said Caprara. The primary goal set by WMU’s Climate Action Plan is carbon neutrality by 2065. Caprara said, “While saving money will always be a primary motivating factor for WMU’s Energy Management Program, the main driving force today is carbon reduction goals implemented to reduce WMU’s impact on the environment.” The Heritage Hall renovation is just one of the many projects that WMU plans to complete to achieve their 2065 goal. WMU strives to be a national higher education sustainability leader. They have implemented sustainable practices on campus including a recycling center, solar panels and a wind turbine. 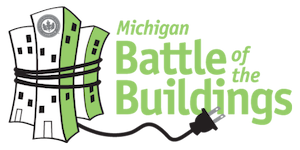 Each year since 2014 they compete in the Michigan Battle of the Buildings “biggest loser” styled energy reduction competition hosted by the US Green Building Council of West Michigan. The competition guides property owners and operators as they benchmark their buildings and gives them a chance to compare the building’s efficiency to others in its category. Thank you for your commitment to our future, WMU! Your dedication to educating tomorrow’s leaders on the importance of sustainability will pay environmental dividends.